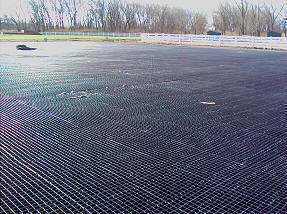 Our Stabilization Grid is a draining, interlocking dense copolymer polypropylene interlocking flooring system, which is capable of withstanding 35,000 pounds of pressure. It can be used for paddock areas, gate areas, horse paths, barn aisle ways, indoor wash stalls, outdoor arenas and round pens, as well as ramp or slope soil stabilization. 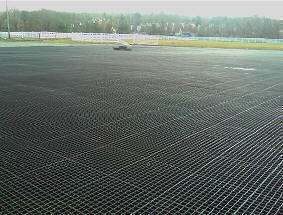 If you have questions about the uses of our stabilization grids, call us or fill out our contact form today! Eliminates filling, leveling, and tamping down dirt floors as opposed to rubber mats or dirt surfaces. Purchase price and installation costs may be capitalized and depreciated instead of expensed. Stabilization Grid is guaranteed not to shift or uproot. Available in 24 x 24-inch squares that are 1-inch thick.